Easily accessible and heavily illustrated, this complete guide to diagnosis in Chinese Medicine places an emphasis on "real world" issues. Focusing on clear interpretations of signs and symptoms, it addresses the practice beyond the theory and leads readers through both basic and sophisticated levels of diagnostic interpretation. Since Chinese medicine diagnosis relies on a subtle appraisal of a patient's disharmony, many factors beyond traditional Western symptoms are considered, including a patient's voice, the absence of thirst, feeling hot or cold, the patient's smell, tone of voice, and glitter of eyes. This practical resource helps readers carefully interpret of a range of nuances. Giovanni Maciocia is one of the most highly-regarded and respected authors and lecturers in the West. He is Visiting Associate Professor at the Nanjing University of Traditional Chinese Medicine and has many years of experience in teaching and practice. Giovanni trained initially in the UK and then in China, learned Chinese to be able to study from original Chinese texts, and was one of the first practitioners and authors to introduce Chinese medicine in a clear and accessible way to a Western student audience. 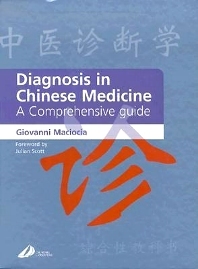 Giovanni Maciocia has written other best-selling books under the Elsevier Churchill Livingstone imprint - The Practice of Chinese Medicine: The Treatment of Diseases with Acupuncture and Chinese Herbs, 2e (ISBN 978-0443074905), Diagnosis in Chinese Medicine: A Comprehensive Guide, 1e (ISBN 9780443064487), The Channels of Acupuncture: Clinical Use of the Secondary Channels and Eight Extraordinary Vessels, 1e (ISBN 9780443074912), The Psyche in Chinese Medicine: Treatment of Emotional and Mental Disharmonies with Acupuncture and Chinese Herbs, 1e (ISBN 9780702029882), and Obstetrics and Gynecology in Chinese Medicine, 2e (ISBN 9780443104220). Acupuncturist and Medical Herbalist, UK; Visiting Professor, Nanjing University of Traditional Chinese Medicine, Nanjing, People's Republic of China.